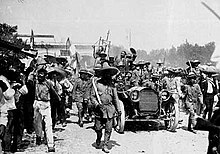 The Mexican Revolution ( Spanish: Revolución mexicana), also known as the Mexican Civil War ( Spanish: guerra civil mexicana), was a major armed struggle, lasting roughly from 1910 to 1920, that radically transformed Mexican culture and government. Although recent research has focused on local and regional aspects of the Revolution, it was a genuinely national revolution. Its outbreak in 1910 resulted from the failure of the 35-year-long regime of Porfirio Díaz to find a managed solution to the presidential succession. This meant there was a political crisis among competing elites and the opportunity for agrarian insurrection. Wealthy landowner Francisco I. Madero challenged Díaz in the 1910 presidential election, and following the rigged results, revolted under the Plan of San Luis Potosí. 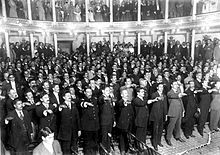 Armed conflict ousted Díaz from power; a new election was held in 1911, bringing Madero to the presidency. The origins of the conflict were broadly based in opposition to the Díaz regime, with the 1910 election becoming the catalyst for the outbreak of political rebellion. The revolution was begun by elements of the Mexican elite hostile to Díaz, led by Madero and Pancho Villa; it expanded to the middle class, the peasantry in some regions, and organized labor. In October 1911, Madero was overwhelmingly elected in a free and fair election. Opposition to his regime then grew from both the conservatives, who saw him as too weak and too liberal, and from former revolutionary fighters and the dispossessed, who saw him as too conservative. 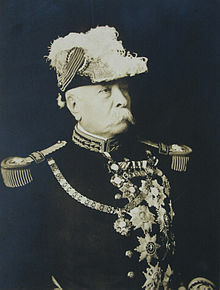 The Porfiriato is the period in late nineteenth-century Mexican history dominated by General Porfirio Díaz, who became president of Mexico in 1876 and ruled almost continuously (with the exception of 1880–1884) until his forced resignation in 1911. After the presidency of his ally, General Manuel González (1880–1884), Díaz ran for the presidency again and legally served in office until 1911. Under his administration, the constitution had been amended to allow unlimited presidential re-election. Díaz had originally challenged Benito Juárez on the platform of "no re-election." During the Porfiriato, there were regular elections, marked by contentious irregularities. Although Díaz had publicly announced in an interview with journalist James Creelman that he would not run in the 1910 election, setting off a flurry of political activity, he changed his mind and decided to run again at age 80. The contested 1910 election was a key political event that contributed to the Mexican Revolution. As Díaz aged, the question of presidential succession became increasingly important. In 1906, the office of vice president was revived, with Díaz choosing his close ally Ramón Corral from among his Científico advisers to serve in the post. By the 1910 election, the Díaz regime had become highly authoritarian, and opposition to it had increased in many sectors of Mexican society. 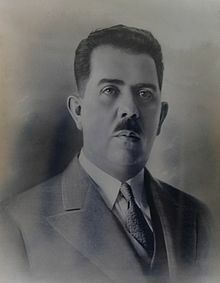 In his early years in the presidency, Díaz was a master politician, playing factions off one another while retaining and consolidating his own power. He used the rurales, an armed police force directly under his control, as a paramilitary force to keep order in the countryside. He rigged elections, arguing that only he knew what was best for his country, and he enforced his belief with a strong hand. "Order and Progress" were the watchwords of his rule. Although Díaz came to power in 1876 under the banner of "no re-election," with the exception of the presidency of Manuel González from 1880–1884, Díaz remained in power continuously from 1884 until 1911, with rigged elections held at regular intervals to give the appearance of democracy. A number of Mexicans began to organize in opposition to Díaz policies that had welcomed foreign capital and capitalists, suppressed nascent labor unions, and consistently moved against peasants as agriculture flourished. In 1905, the group of Mexican intellectuals and agitators who had created the Mexican Liberal Party (Partido Liberal de México) drew up a radical program of reform, specifically addressing what they considered to be the worst aspects of the Díaz regime. Most prominent in the PLM were Ricardo Flores Magón and his two brothers, Enrique and Jesús. They, along with Luis Cabrera Lobato and Antonio Díaz Soto y Gama, were connected to the anti-Díaz publication El Hijo del Ahuizote. Political cartoons by José Guadalupe Posada lampooned politicians and cultural elites with mordant humor, portraying them as skeletons. The Liberal Party of Mexico founded the anti-Díaz anarchist newspaper Regeneración, which appeared in both Spanish and English. In exile in the United States, Práxedis Guerrero began publishing an anti-Díaz newspaper, Alba Roja (Red Dawn), in San Francisco. Although leftist groups were small in numbers, they became highly influential through their publications which helped articulate opposition to the Díaz regime. Francisco Bulnes described these men as the “true authors” of the Mexican Revolution for agitating the masses. As the 1910 election approached, Francisco I. Madero, an idealistic political novice and member of one of Mexico's richest families, funded the newspaper Anti-Reelectionista, in opposition to the continuous re-election of Díaz. These strikes were ruthlessly suppressed, with factory owners receiving support from government forces. In the Cananea strike, mine owner William Cornell Greene received support from Díaz's rurales in Sonora as well as Arizona Rangers called in from across the U.S. border. In the state of Veracruz, the Mexican army gunned down Rio Blanco textile workers and put the bodies on train cars that transported them to Veracruz, "where the bodies were dumped in the harbor as food for sharks". Government suppression of strikes was not unique to Mexico, with parallel occurrences both in the United States and Western Europe. Díaz had ruled continuously since 1884. The question of presidential succession was an issue as early as 1900, when Díaz turned 70. It was his "undeclared intention to step down from the presidency in 1904." Díaz seems to have considered his finance minister José Yves Limantour as his successor. Limantour was a key member of the Científicos, the circle of technocratic advisers steeped in positivist political science. Another potential successor was General Bernardo Reyes, Diaz's Minister of War, who also served as governor of Nuevo León. Reyes, an opponent of the Científicos, was a moderate reformer with a considerable base of support. Díaz became concerned about him as a rival, and forced his resignation from his cabinet. He attempted to marginalize Reyes by sending him on a "military mission" to Europe,  distancing him from Mexico and potential political supporters. 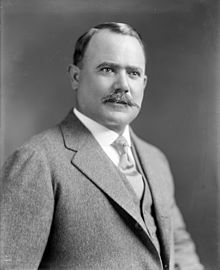 In a 1908 interview with U.S. journalist James Creelman, Díaz said that Mexico was ready for democracy and that he would step down to allow other candidates to compete for the presidency. If Díaz had kept to this, the presidency and vice presidency would have been open in 1910. Díaz's later reversal on retiring from the presidency set off tremendous activity among opposition groups. In 1910, Francisco I. Madero, a young man from a wealthy land-owning family in the northern state of Coahuila, announced his intent to challenge Díaz for the presidency in the next election, under the banner of the Anti-Reelectionist Party. Madero chose as his running mate Francisco Vázquez Gómez, a physician who had opposed Díaz. Although similar overall to Díaz in his ideology,[ citation needed] Madero hoped for other elites to rule alongside the president. Díaz thought he could control this election, as he had the previous seven;  however, Madero campaigned vigorously and effectively. To ensure Madero did not win, Díaz had him jailed before the election. Madero escaped and fled for a short period to San Antonio, Texas. Díaz was announced the winner of the election by a "landslide". 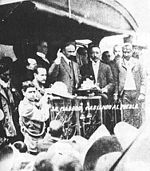 When it became obvious that the election had been fixed, Madero supporter Toribio Ortega took up arms with a group of followers at Cuchillo Parado, Chihuahua on 10 November 1910. Madero was an inexperienced politician who had never held office before, but his election as president in October 1911, following the exile of Porfirio Díaz in May 1911 and the interim presidency of Francisco León de la Barra, raised high expectations for positive change. However, the Treaty of Ciudad Juárez guaranteed that the essential structure of the Díaz regime, including the Federal Army, was kept in place. Madero fervently held to his position that Mexico needed real democracy, which included regime change by valid election, a free press, and the right of labor to organize and strike. The rebels who brought him to power were demobilized and Madero called on these men of action to return to civilian life. According to a story told by Pancho Villa, (one of those who had defeated Díaz's army and forced his resignation and exile), he told Madero at a banquet in Ciudad Juárez in 1911, "You [Madero], sir, have destroyed the revolution.... It's simple: this bunch of dandies have made a fool of you, and this will eventually cost us our necks, yours included." Ignoring the warning, Madero increasingly relied on the Federal Army as armed rebellions broke out in Mexico in 1911–1912, with particularly threatening insurrections led by Emiliano Zapata in Morelos and Pascual Orozco in the north. Madero did not have the experience or the ideological inclination to reward men who had helped bring him to power. Some revolutionary leaders expected personal rewards, such as the young and militarily gifted Pascual Orozco of Chihuahua. Others wanted major reforms, most especially Emiliano Zapata and Andrés Molina Enríquez, who had long worked for land reform in Mexico. Madero met personally with Zapata, telling the guerrilla leader that the agrarian question needed careful study. His meaning was clear: Madero, a member of a rich northern hacendado family, was not about to implement comprehensive agrarian reform for aggrieved peasants. During the Orozco revolt, the governor of Chihuahua mobilized the state militia to support the Federal Army, and Pancho Villa, a colonel in the militia, was called up at this time. In mid-April, at the head of 400 irregular troops, he joined the forces commanded by Huerta. Huerta, however, viewed Villa as an ambitious competitor. During a visit to Huerta's headquarters in June 1912, after an incident in which he refused to return a number of stolen horses, Villa was imprisoned on charges of insubordination and robbery and sentenced to death. Raúl Madero, the President's brother, intervened to save Villa's life. Jailed in Mexico City, Villa fled to the United States, later to return and play a major role in the civil wars of 1913–1915. Huerta allowed the rebels to hold the armory in Mexico City, the Ciudadela, while Huerta consolidated his political power. Huerta changed allegiance from Madero to the rebels under Félix Díaz (Bernardo Reyes having been killed early in the conflict). U.S. 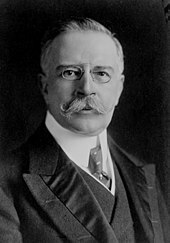 Ambassador Henry Lane Wilson, who had done all he could to undermine U.S. confidence in Madero's presidency, brokered the Pact of the Embassy, which formalized the alliance between Félix Díaz and Huerta, with the backing of the United States. Huerta was to become provisional president of Mexico following the resignations of Madero and his vice president, José María Pino Suárez. Rather than being sent into exile with their families, the two were murdered while being transported to prison, a shocking event, but one that did not prevent the Huerta regime's recognition by most world governments. Supporting the Huerta regime initially were business interests in Mexico, both foreign and domestic; landed elites; the Roman Catholic Church; as well as the German and British governments. Huerta's first cabinet comprised men who had supported the February 1913 Pact of the [U.S.] Embassy, among them some who had supported Madero, such as Jesús Flores Magón; supporters of Bernardo Reyes; supporters of Félix Díaz; and Catholic former interim president Francisco León de la Barra. Initially, Huerta was even able to muster the support of Andrés Molina Enríquez, author of The Great National Problems (Los grandes problemas nacionales), a key work urging land reform in Mexico. Huerta was deeply concerned with the issue of land reform since it was a persistent spur of peasant unrest. Specifically, he moved to restore "ejido lands to the Yaquis and Mayos of Sonora and [advanced] proposals for distribution of government lands to small-scale farmers." When Huerta refused to move faster on land reform, Molina Enríquez disavowed the regime in June 1913,  later going on to advise the 1917 constitutional convention on land reform. His resignation marked the end of an era since the Federal Army, a spectacularly ineffective fighting force against the revolutionaries, ceased to exist. The revolutionary factions that had united in opposition to Huerta's regime now faced a new political landscape with the counter-revolutionaries decisively defeated. The revolutionary armies now contended for power and a new era of civil war began. With the departure of Huerta in July 1914, the revolutionary factions agreed to meet and make “a last ditch effort to avert more intense warfare than that which unseated Huerta.”  Called to meet in Mexico City in October 1914, revolutionaries opposed to Carranza's influence successfully moved the venue to Aguascalientes. The Convention of Aguascalientes did not, in fact, reconcile the various victorious factions in the Mexican Revolution, but was a brief pause in revolutionary violence. The break between Carranza and Villa became definitive during the Convention. Carranza had expected to be confirmed in his position as First Chief of revolutionary forces, but his supporters "lost control of the proceedings." Opposition to Carranza was strongest in areas where there were popular and fierce demands for reform, particularly in Chihuahua, where Villa was powerful, and Morelos, where Zapata held sway. The Convention of Aguascalientes brought that opposition out in an open forum. In practice, the alliance between Villa and Zapata as the Army of the Convention did not function beyond this initial victory against the Constitutionalists. Villa and Zapata left the capital, with Zapata returning to his southern stronghold in Morelos, where he continued to engage in warfare under the Plan of Ayala. Lacking a firm center of power and leadership, the Convention government was plagued by instability. Villa was the real power emerging from the Convention, and he prepared to strengthen his position by winning a decisive victory against the Constitutionalist Army. Another advantage of Carranza's position was the Constitutionalists' control of Veracruz, even though the United States still occupied it. The United States had concluded that both Villa and Zapata were too radical and hostile to U.S. interests and sided with the moderate Carranza in the factional fighting. 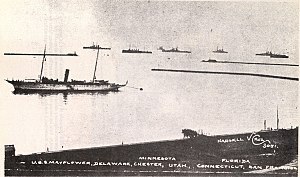 The U.S. timed its exit from Veracruz, brokered at the Niagara Falls peace conference, to benefit Carranza, and allowed munitions to flow to the Constitutionalists. The U.S. granted Carranza's government diplomatic recognition in 1915. Carranza had gained recognition from the United States, which enabled arms sales to his forces. Villa had previously been friendly toward the U.S., but its recognition of Carranza, as well as Villa's decisive defeat at Celaya, finished him as a major force in Mexico. In 1916, Villa attacked Columbus, New Mexico. Under heavy pressure from public opinion to punish the attackers (stoked mainly by the papers of ultra-conservative publisher William Randolph Hearst, who owned a large estate in Mexico), U.S. President Wilson sent Gen. John J. Pershing and around 5000 troops into Mexico in an attempt to capture Villa. The American intervention, known as the Punitive Expedition, was limited to the western sierras of Chihuahua, and was notable as the U.S. Army's first use of airplanes in military operations. Villa knew the inhospitable terrain intimately and had little trouble evading his pursuers. After nearly a year the hunt was called off, and Pershing's force returned to the U.S. Carranza asserted Mexican sovereignty and forced the U.S. to withdraw in 1917. Although villistas and zapatistas were excluded from the Constituent Congress, their political challenge pushed the delegates to radicalize the Constitution, which in turn was far more radical than Carranza himself. While he was elected constitutional president in 1917, he did not implement its most radical elements. He was not in a position to do so in any case, since there were still threats to his regime regionally, despite the relative subsidence of violence nationally. Despite pressures from the U.S., Obregón flirted with the newly formed USSR. To appeal to intellectuals and left-leaning peasants, official Mexican propaganda began having a very Marxist spin. Murals with Lenin and Trotsky began to appear in government buildings. Despite the sympathy towards socialism, the government began to ferment nationalism amongst the peasantry. This was accomplished by memorializing revolutionary figures and creating anti- Western murals. Among the artists employed was Diego Rivera, who had a Mexican nationalist and Marxist tinge to his government murals. Despite these moves towards an anti-Western and pro-socialist regime, Obregón did not separate the Mexican economy from foreign capitalists, allowing free trade with some restrictions. The Mexico City Metro has stations commemorating aspects of the Revolution and the revolutionary era. When it opened in 1969, with line 1 (the "Pink Line"), two stations alluded to the Revolution. Most directly referencing the Revolution was Metro Pino Suárez, named after Francisco I. Madero's vice president, who was murdered with him in February 1913. The other was Metro Balderas, whose icon is a cannon, alluding to the Ciudadela armory where the coup against Madero was launched. In 1970, Metro Revolución opened, with the station at the Monument to the Revolution. As the Metro expanded, further stations with names from the revolutionary era opened. In 1980, two popular heroes of the Revolution were honored, with Metro Zapata explicitly commemorating the peasant revolutionary from Morelos. A sideways commemoration was Metro División del Norte, named after the Army that Pancho Villa commanded until its demise in the Battle of Celaya in 1915. The year 1997 saw the opening of the Metro Lázaro Cárdenas station. In 1988, Metro Aquiles Serdán honors the first martyr of the Revolution Aquiles Serdán. In 1994, Metro Constitución de 1917 opened, as did Metro Garibaldi, named after the grandson of Italian fighter for independence, Giuseppi Garibaldi. The grandson had been a participant in the Mexican Revolution. In 1999, the radical anarchist Ricardo Flores Magón was honored with the Metro Ricardo Flores Magón station. Also opening in 1999 was Metro Romero Rubio, named after the leader of Porfirio Díaz's Científicos, whose daughter Carmen Romero Rubio became Díaz's second wife. In 2012, a new Metro line opened with a Metro Hospital 20 de Noviembre stop, a hospital named after the date that Francisco I. Madero in his 1910 Plan de San Luis Potosí, called for rebellion against Díaz. There is no Metro stop named for Madero, or for Carranza, Obregón, or Calles, and only an oblique reference to Villa in Metro División del Norte. The popular heroes of the Mexican Revolution are the two radicals who lost: Emiliano Zapata and Pancho Villa. Dynamic equestrian statues of popular revolutionaries Zapata and Villa were erected in their respective strongholds. Zapata's name was appropriated by the rebels of Chiapas, the Zapatista Army of National Liberation (EZLN) while those who took and held power have a far more muted historical remembrance. Venustiano Carranza led the victorious Constitutionalist faction, but his attempt to impose a civilian presidential successor unacceptable to northern revolutionary generals prompted Carranza's flight from Mexico City in 1920 and then murder. Carranza is now buried in the Monument to the Revolution and there is a museum in his honor. In that museum, "are the bullets taken from the body of Francisco I. Madero after his murder. Carranza had kept them in his home, perhaps because they were a symbol of a fate and a passive denouement he had always hoped to avoid." 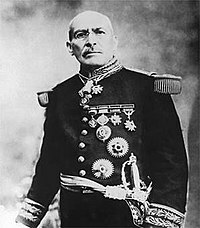 Revolutionary general Plutarco Elías Calles founded the dominant Mexican political party of the twentieth century, but his attempt to continue his control to the presidency of Lázaro Cárdenas resulted in Cárdenas expelling him from Mexico. Neither Carranza nor Calles has much of note named for them in Mexico, although both are significant figures in the country's history. An important element the Revolution's legacy is the 1917 Constitution. It was pushed forward by populist generals within Carranza's government to undermine the popular support that Pancho Villa and Emiliano Zapata held. It was not written by liberal elites or the military itself, but rather young radicalized professionals, giving the document some authenticity for the peasantry. The document brought numerous reforms demanded by populist factions of the revolution, with article 27 empowering the state to expropriate resources deemed vital to the nation. These included expropriation of hacienda lands and redistribution to peasants. Article 27 also empowered the government to expropriate holdings of foreign companies, most prominently seen in the 1938 expropriation of oil. In Article 123 the constitution codified major labor reforms, including an 8-hour work day, a right to strike, equal pay laws for women, and an end to exploitative practices such as child labor and company stores. The constitution strengthened restrictions on the Roman Catholic Church in Mexico. In the early 1990s, the government introduced reforms to the constitution that rolled back the government's power to expropriate property and its restrictions on religious institutions. Just as the government of Carlos Salinas de Gortari was amending significant provisions of the constitution, Metro Constitución de 1917 station was opened. ^ a b c d Centeno, Ramón I. (1 February 2018). "Zapata reactivado: una visión žižekiana del Centenario de la Constitución". Mexican Studies/Estudios Mexicanos. 34 (1): 36–62. doi: 10.1525/msem.2018.34.1.36. ISSN 0742-9797. ^ Castillo, Máximo (2016). Valdés, Jesús Vargas (ed.). Máximo Castillo and the Mexican Revolution. Translated by Aliaga-Buchenau, Ana-Isabel. Baton Rouge, Louisiana: Louisiana State University Press. pp. 51–58. ISBN 978-0807163887.
" From Soldaderas to Comandantes" Zapatista Direct Solidarity Committee. University of Texas. Gilbert, Dennis. " Emiliano Zapata: Textbook Hero." Mexican Studies. Berkley: Winter 2003, Volume 19, Issue 1, Page 127. Merewether Charles, Collections Curator, Getty Research Institute, " Mexico: From Empire to Revolution", Jan. 2002. Rausch George Jr. " The Exile and Death of Victoriano Huerta", The Hispanic American Historical Review, Vol. 42, No. 2, May 1963 pp. 133–151. Tuck, Jim. " Zapata and the Intellectuals." Mexico Connect, 1996–2006. 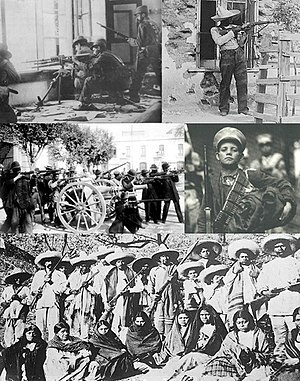 Wikimedia Commons has media related to Mexican Revolution.